Part-Time Workers Say Schedules Are Getting More Erratic For many workers, hours are not only short, but increasingly erratic as managers scramble to cover shifts without the steadying influence of experienced full-time employees. Part-time jobs have been proliferating this year as employers hold back on hiring. In the 1980s, a popular fast-food commercial touted chicken-breast sandwiches — and mocked chicken nuggets sold by competitors. In the ad, a competitor's doofus clerk explains nuggets. "All the parts are crammed into one big part," he said. "And parts is parts." Today, clerks may believe that catchphrase could apply to them as regular full-time schedules disappear. For many workers, hours are not only short, but increasingly erratic as managers scramble to cover shifts without the steadying influence of experienced full-time employees. "It's ridiculous," says Amere Graham, an 18-year-old high school graduate who works at a McDonald's in Milwaukee. "My schedule is all over the place. It's completely unpredictable." Government data support Graham's impressions of workplace conditions. 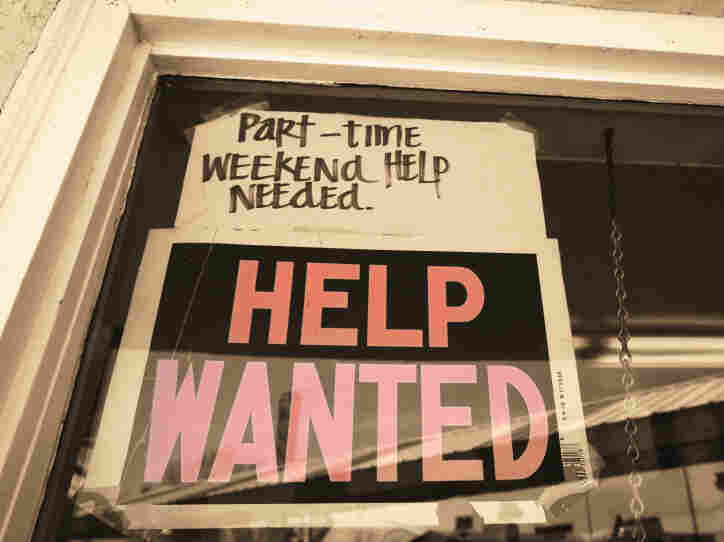 The ranks of people working part time because they can't find full-time jobs have roughly doubled since the summer of 2007, from about 4.3 million to 8.2 million. "There has been a surge in part-time work," says Aparna Mathur, an economist at the American Enterprise Institute. The change reflects business owners' reluctance to hire full-time workers while they still have so many worries about the strength of the recovery and the cost of the Affordable Care Act, Mathur says. "You want to maintain flexibility so you can respond to the economy" without having to carry the costs of hiring and firing full-time employees, she says. In a study of retail working conditions, conducted in the fall of 2011 in New York, only 17 percent of retail workers said they have a set schedule. With so many people working in so many part-time positions, frustrations are growing, according to Michael Wilder, coordinator at Wisconsin Jobs Now, a union-supported group that advocates for low-wage workers. Comp Time Or Cold Cash. Which Would You Pick? "Workers can get called in at any time, and sometimes you only get a couple of hours of notice before you have to start work," says Wilder. "That makes it harder to deal with child care," as well as with transportation, doctor appointments and so on, he says. Graham says the chaotic scheduling also complicates any plans for attending college classes or taking a second job. "It's pretty much impossible to work two jobs or try to move up," he says. An employer's inconsistent scheduling "is unfair because it entraps you," he adds. But Mathur says employers are not trying to be unfair. Instead, their goal is to survive in a slow-growing economy, and they know that with the unemployment rate still at 7.6 percent, she says, "many people are willing to take part-time work." And while a weak recovery is the main restraint on hiring plans, employers also are worried about the financial impact of the Affordable Care Act, she says. That federal law soon will require employers with 50 or more full-time workers to offer affordable insurance to employees working 30 or more hours per week. Not hiring full-time workers right now reflects "strategic thinking on the part of businesses that fear they are going to face higher costs," Mathur says. Such concerns were reflected in survey results released Tuesday by Sageworks, a company that analyzes the financial results of private companies. The poll of 300 accountants who work with private companies found that 2 out of 3 say concern about the new law is dampening hiring plans.